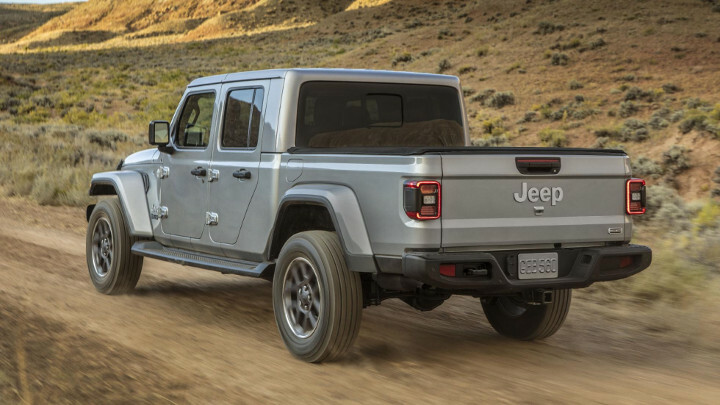 The new Jeep Gladiator might look like just a Wrangler with a pickup bed attached. But it’s quite a bit more than that—it’s the beginning of your adventures. 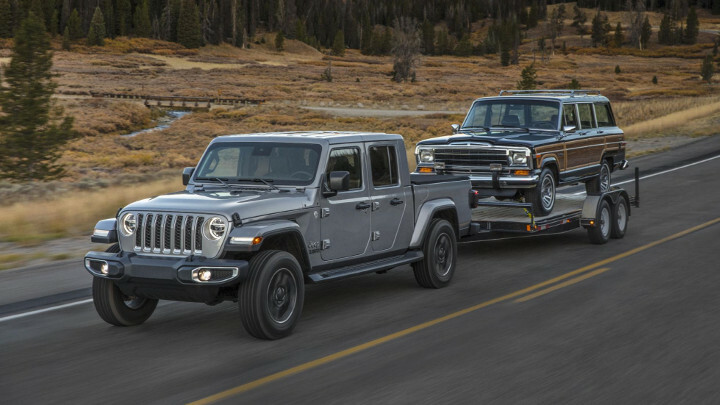 It’s been over 27 years since the last true Jeep pickup featured in the range—the Cherokee-based trucklet called the Comanche—and 33 years since the stretched CJ-8-based half-cab Scrambler saw the light of day. So the company hasn’t taken lightly the launch of this truck. 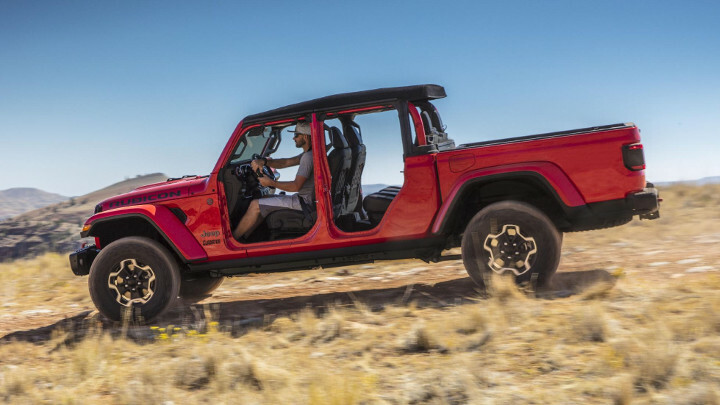 Jeep has given it all the take-the-doors-off, open-air, go-anywhere freedom and ruggedness of the Wrangler, then added a platform to carry up to 726kg or tow up to 3,470kg of toys or cargo. 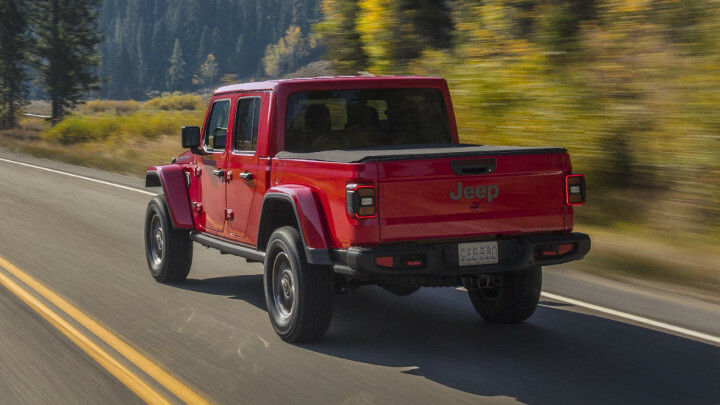 Jeep reckons it is the very best in the midsize class—that includes the new Ford Ranger, the Chevy Colorado, and Toyota Hilux. And, once you’ve had a walk around it, driven it on and off road, it’s not hard to see why. It’s very much a lifestyle truck, with a focus on facilitating adventures, rather than being purely functional. It’s not cheap, but then its competitors don’t have half of the emotional draw. The range is relatively simple to navigate. There are four variants to choose from: base Sport, Sport S, mid-level Overland, and full-house rock-crawling Rubicon. 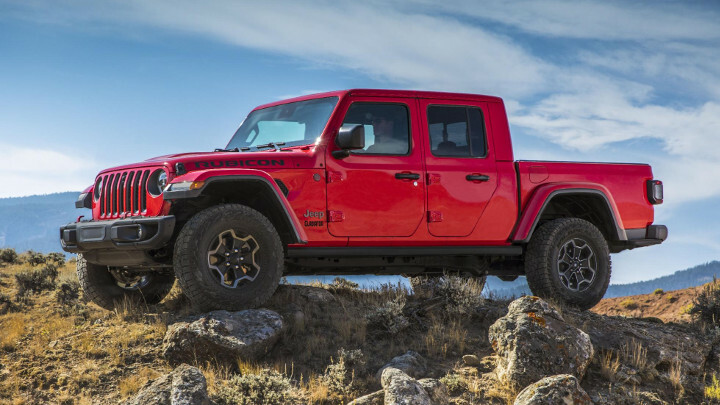 All variants are Trail Rated: The Sport and the Overland get Command-Trac 4x4 systems, the Rubicon come with the pro-level Rock-Trac setup that includes heavy-duty axles, electronic sway-bar disconnect, and a crawl ratio—in the six-speed manual version—of a scarcely believable 84.2:1. Why did the company go with the Gladiator name rather than the Scrambler moniker? 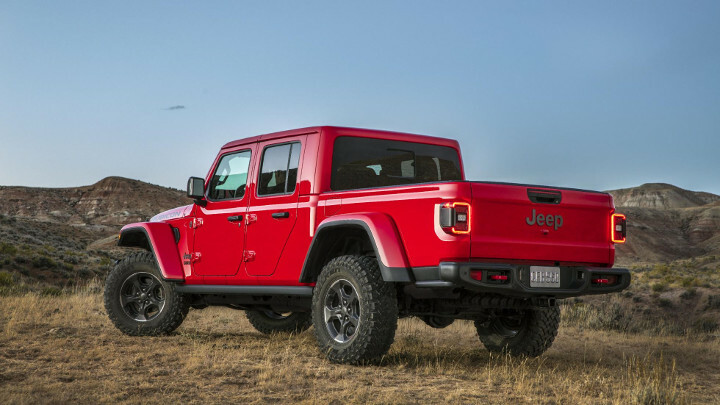 Simple, says Jeep: Because Gladiator has always been the name of the full-size Jeep trucks since the company started making them in 1962. So, as much as everyone loves the Scrambler name, it wasn’t right for this application. 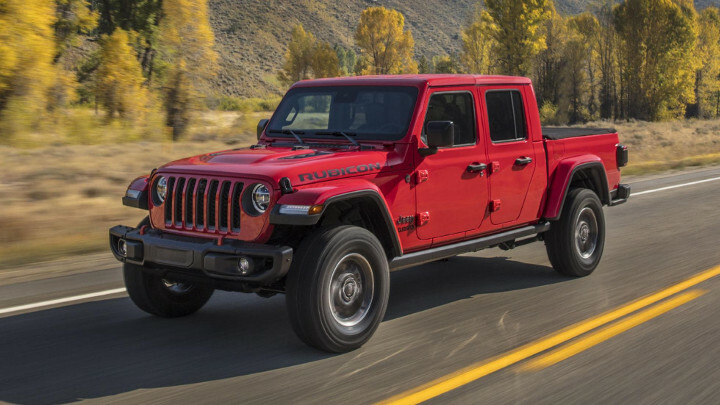 Jeep could add a half-cab version at a later date and bring it back. What caused the decades-long wait for a new Gladiator? The brand people say they have been so busy trying to keep up with global insatiable appetite for Wranglers—annual demand has tripled for the model since 1997—that there hasn’t been time or space. But then a couple of years ago, they found $700 million (P36.33 billion) down the back of the corporate couch to retool the Toledo factory and make space for the new Jeep pickup. And here it is. 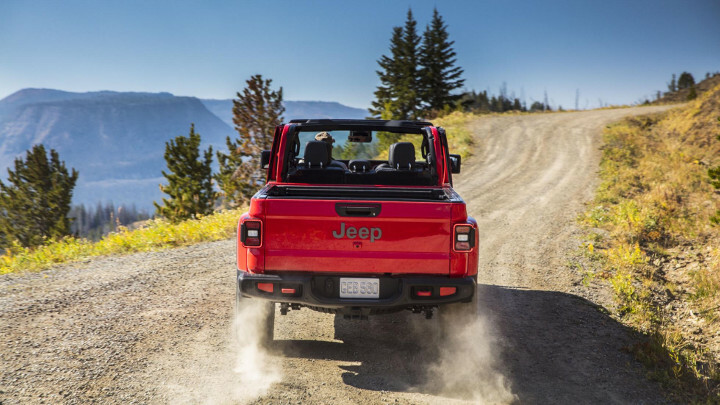 Driving the Gladiator on the road is not as punishing as its off-road credentials might suggest. The body-on-frame rig’s extra 49.3cm of wheelbase allied to the new shocks front and rear—the Rubicon gets Fox units—give it a surprisingly compliant, comfortable, and quiet ride. 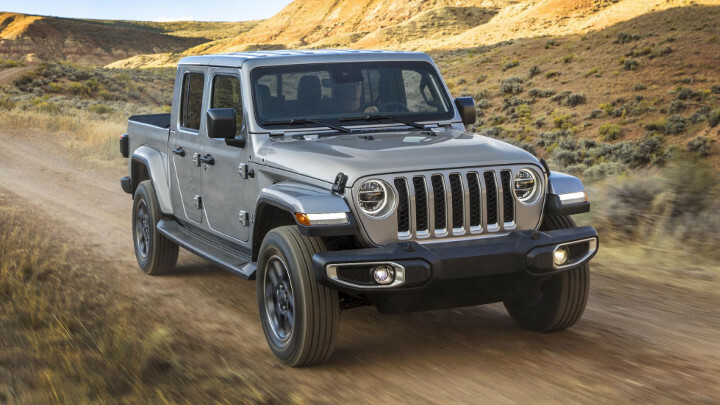 More so even than the new Wrangler, which is already a dramatic improvement on the shake-rattle-and-roll fest that was the previous model. The steering is quite low-geared, to give it the required off-road precision, but other than that, you are rarely reminded that the Gladiator’s frame is just under 79cm longer than the Wrangler’s. The test route we took it on featured a long sequence of tight turns and significant changes in camber and surface quality. The Gladiator dealt with them all without causing any issues. Off-road, on the suitably muddy and frankly impossible-looking rock-crawling course, the truck shocked us with its extraordinary ability to get into and out of some locations. One point of note, made on some of the most severe downhill rock sections, is that the longer wheelbase allows the Gladiator to drag its tail to stabilize and slow itself. The truck comes as standard with a six-speed manual, but unless you want the extreme crawl ratio that delivers, the eight-speed auto is definitely the right choice. Apart from giving you two overdrive gears on the road, to keep revs and engine noise down and improve economy, the manual’s action isn’t anything special. Engine choice at launch is solely the 3.6-liter Pentastar V6 (285hp, 352Nm) with start-stop. It’s a tried and trusted unit we’ve seen and driven many times before. And it’s more than fine in this application, too. 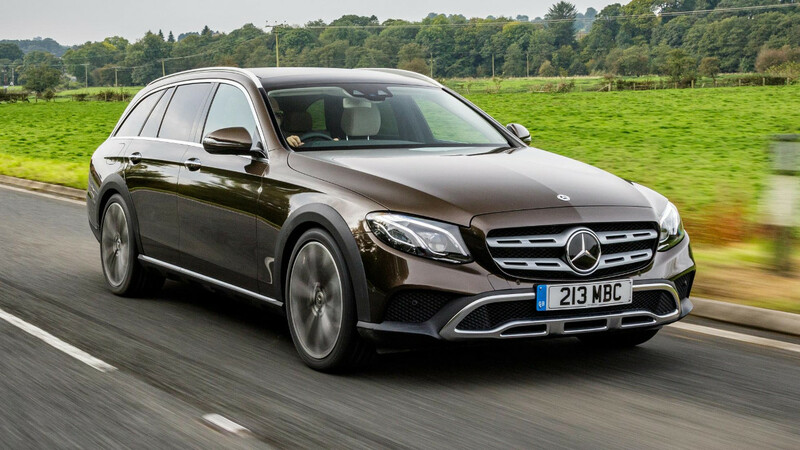 It has a broad, linear spread of power and torque, doesn’t consume too much gas, and generally keeps to itself during most drives. There will be a 260hp/600Nm 3.0-liter Ecodiesel engine added to the lineup later. 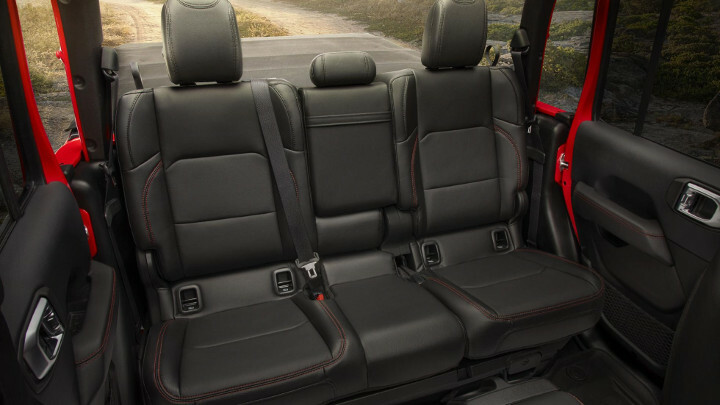 If the Gladiator’s rugged exterior looks promise an adventure-ready vehicle, the interior cements that feeling. 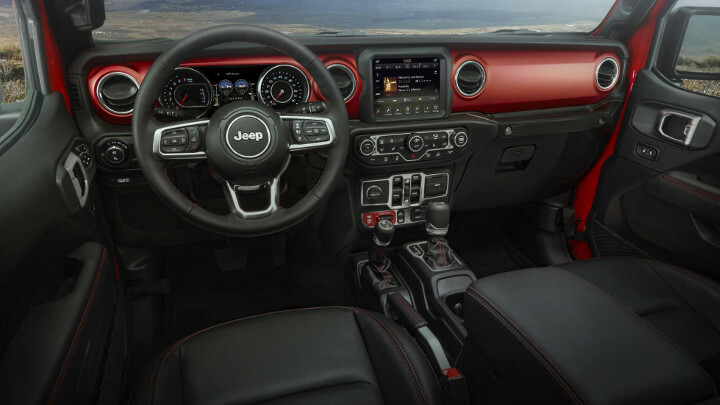 Boasting the same satisfyingly chunky, color-coded, high-function layout that debuted in the Wrangler, the Gladiator adds a couple of new features to the mix. 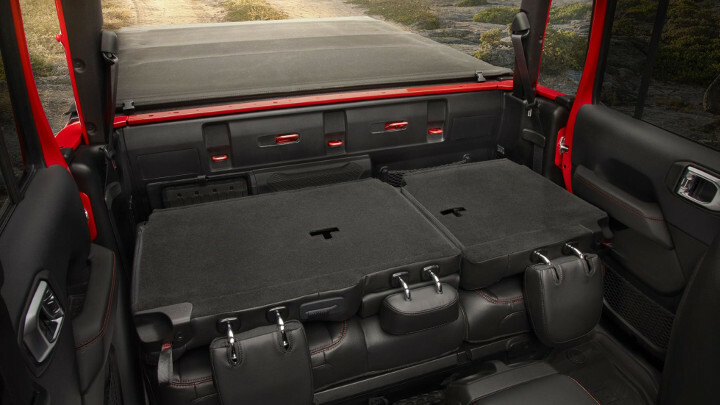 Such as all-new rear seats—available, like the fronts, in either cloth or leather—that can be folded in a number of different ways to carry more stuff or people. Plus conceal a huge lockable bin to stash all your gear. This is especially valuable if you exercise your right to remove the Gladiator’s doors and roof, and want to keep your valuables safe when you park up at the trail head/beach/jetty/motocross track. It’s worth noting that Jeep’s designers and engineers have thought about where to put all the detachable panels—and the bolts, which live in an underseat storage bin—when you take them off. So that hunt for an elusive bolt as the rainstorm starts should be that much shorter. Other than all the tech you’d expect to find, there are a couple of interesting tech easter eggs available. Rubicon models can be spec’d with a forward-facing off-road trail camera, complete with mini powerwasher. And all variants can be fitted with a portable wireless speaker that lives, and is charged, in a docking station on the rear quarter panel. All this and the windshield still folds flat onto the hood of the truck. There isn’t another pickup that can do that. It’s hard to imagine how owning a Gladiator—if you appreciate the way it looks—could be anything other than a daily pleasure. Apart from its adventure-ready promise making you think about new places to explore, it should be an enduring and relatively inexpensive truck to own and operate. 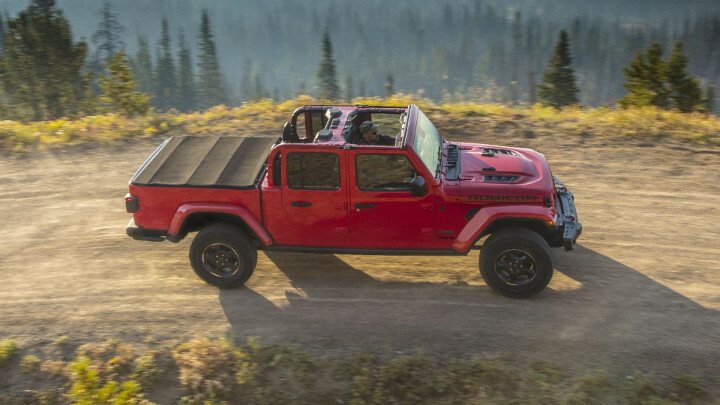 Using a majority of Wrangler parts—and some RAM truck suspension bits at the back—the Gladiator is built out of readily available components. Likewise, customizing your Gladiator will not be hard. 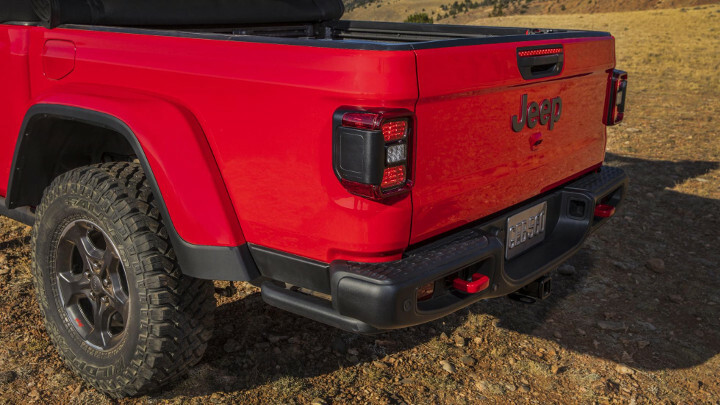 Mopar already has more than 200 Jeep performance parts and accessories for the new pickup, including lights, covers, rails, and lift kits. You’ll be able to tune yours to your exact needs and tastes—and get them covered by the factory warranty. 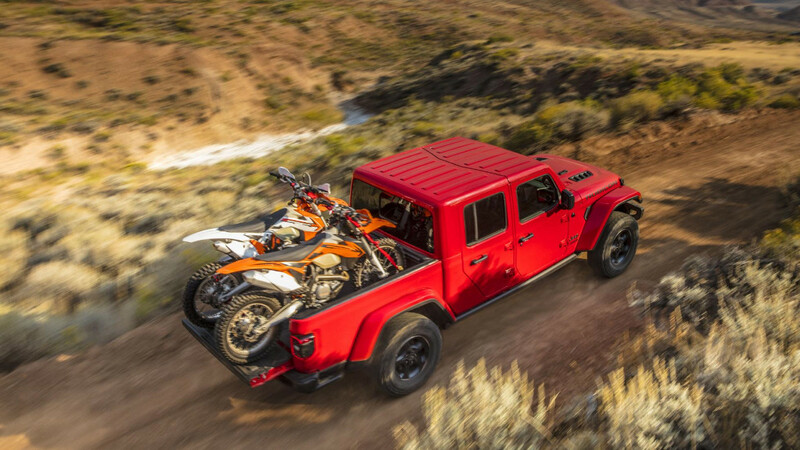 The pickup bed’s max load of 726kg isn’t huge, but it’s more than ample for carrying a couple of dirt bikes, a side by side, or a stack of snowboards. Similarly, the towing capacity isn’t huge, but you can still tow a good size boat or horse trailer with 3,470kg to play with. So it’s got you covered for pretty much any outdoor pursuit you aim your imagination at. 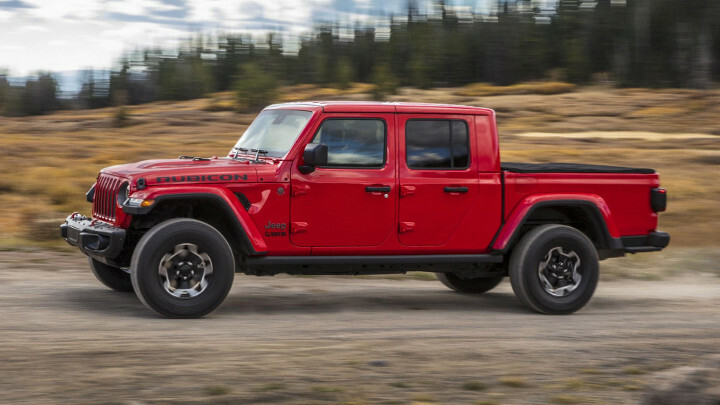 The Jeep Gladiator is probably not the truck you need—it’s the truck you want. In the same way that the Ford Raptor trucks shun their workaday roots and sell you on their rarely used but much-touted sand-flinging, Baja-rushing heritage instead, the Gladiator allows you to freely associate with the adventure and utility of Wrangler and RAM products, then delivers the slam dunk by giving you both brands’ best bits in one package. Even though its starting price of over $35,000 (about P1.82 million) is way above any of its midsize competition, that really isn’t an issue. The closest competitor is the Chevy Colorado ZR2, which starts at $41,000 (P2.13 million) and really doesn’t get close to the Gladiator in terms of visual and brand appeal. As competent as the ZR2 is, it also doesn’t feel anything like as special and fun to drive. So should you get a Wrangler or a Gladiator? If space is an issue and you do more urban work, then the shorter Wrangler makes more sense. 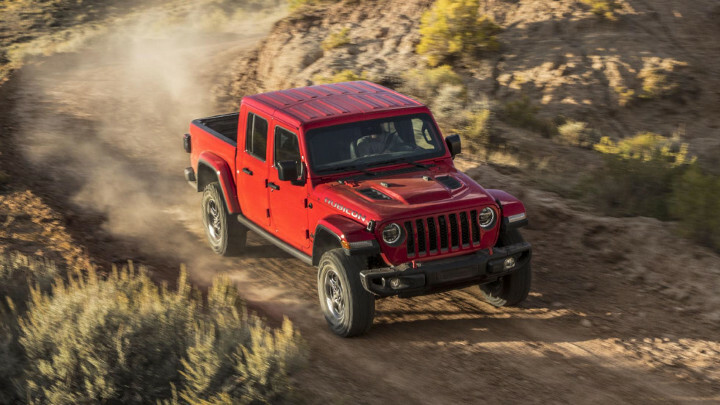 But the added flexibility and carrying capacity of the Gladiator—especially with a bed cover—gives a completely new dimension to the Jeep brand. 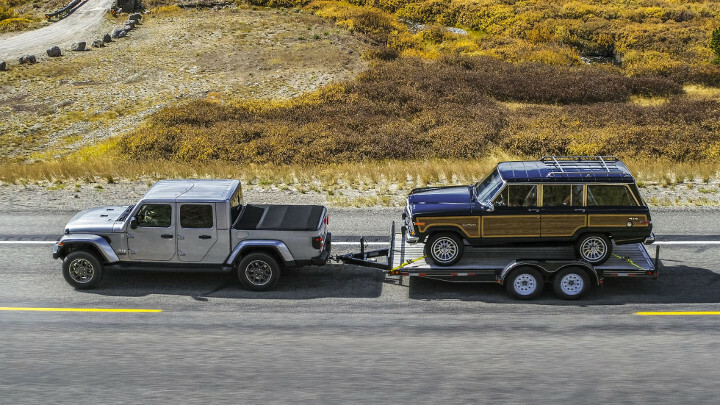 One that links Jeep to a whole new world of vehicles to be carried and towed. For that reason alone, that would make it our choice. Which model to get is a bit more of a head-scratcher. The Rubicon is clearly the most accomplished and bristling with Jeepness, but an Overland in black with a lift kit and some bigger wheels would be a great daily driver for a good chunk less. But it doesn’t really matter. If you like the way it looks, you’ll be ecstatic with the way any of the Rubicons operate. It does exactly what it says on the tin.